Amy Dickinson is an American agony aunt who writes the syndicated advice column 'Ask Amy'. 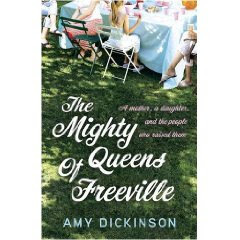 'The Mighty Queens of Freeville' is her story about life, love, her daughter, her tight connection with her family, her hometime of Freeville and her pets. It's a trip through a life that will resonate with many readers. Amy doesn't claim to have all the answers, but she does know the value of family. Her immediate family is practically all female (hence the book's title) and she herself raised her daughter as a single parent following a divorce. Amy and her daughter, Emily, lived for a while in Washington D.C. and Chicago, but they always find themselves returning to her small hometown of Freeville and her family. There is a quiet sense of humour and dry with throughout the book. One suspects it is one of Dickinson's key weapons in dealing with life. Speaking of her divorce and her father's abandonment of his family she says "One advantage to actual abandonment is that it cuts down on marital discord. In order to fight with my father, my mother would have had to locate him first." This is a positive upbeat story about the affirming support of family and smalltown communities. It will make a lot of readers feel happier in their hears, and that is no mean feat.